The Roto Grip Idol bowling ball begins the next generation of upper mid-performance bowling balls. This ball introduces the Ikon core which helps provide good backend by pushing the limits of a symmetrical core. This ball also introduces the MicroTrax-S18 Solid Reactive coverstock. This cover uses Nano technology and provides more traction and is more aggressive than previous coverstocks in this line. This ball is ideally used on medium to heavy oil conditions. *There will be some variance in color due to the Nano material. This is due to "phasing". Some of the balls with phasing have a white color in them and some may appear to have water spots. There may be a variety of hues of the Magenta/Purplish color. The Idol features new everything, new core in the super aggressive symmetric Ikon core, and Micro Trax-18, their strongest Nano cover to date. This is easily the strongest ball Roto has released in the HP3 line, stronger than the Haywire even by a couple boards, and challenges the GB3 for the most hook in a symmetric ball and at that price point on the market. The result is a very smooth, even, controllable, and naturally strong ball that due to the characteristics of the Nano cover is more versatile than most balls that strong, as well as very continuous and great at blending wet/dry transition without jerking or burning energy on friction. The Idol should be a serious consideration for sport tournament bowlers and especially collegiate bowlers looking for a strong symmetric 1 ball. Well, when I first heard of the Haywire being discontinued I was upset. It is one of my favorites. Now that I have the Idol there is absolutely no disappointment here anymore. I am very impressed with the new Idol. On a fresh 40’ house shot it was easy to get the Idol through the fronts with a GREAT mid lane read and strong continuation through the pins. One of the biggest thing I have noticed with the Idol is when throwing it with more traffic, I could make smaller moves left than most normal moves with several on the pair. The more I have bowled with my Idol as it now as a littles lane shine, it just gets better and better. With the little bit of lane shine my Idol has it is so clean and strong off of the spot. I know with my Idol at box finish it’ll tackle all heavier oiled oil patterns. I have a few friends with the Idol that has it shiny, and it is super clean and real angular down lane. The Idol is sure to fit in all bowlers arsenals. Great job!! Likes: Clean through the fronts. Strong backend. I drilled my IDOL 60/4.5/40 which is my standard drilling for a ball to read early plus I have a DAREDEVIL TRICK with the same lay out. I put a 7/8"-2" deep weight hole 5" straight across my center line. I left this one box finish which is 2000 abralon. I have used this one on a couple of different THS, a modified house pattern on the longer side, and a 45 Kegel Challenge Pattern. This ball is a good look for me in my bag and replaces a HAYWIRE that had gotten dated and losing it's pop after a few years. Side by side with a couple of balls like the DAREDEVIL TRICK and NO RULES EXIST in the Roto line. The EXIST is a slightly stronger look downlane. The IDOL grabs but is more of an earlier strong arcing shape while the EXIST is more of a hockey stick reaction on the back. The TRICK had the shape as the IDOL in the early move but was even softer off the spot than the IDOL and would be more in play if the play was to keep the ball in front of you more than with those other 2 ROTO high end pieces. I also put it up against the CODE X. The IDOL was more motion early while the CODE X was more downlane motion and looked a lot like a softer NO RULES EXIST. Put this one in your bag if you want a strong ball that reads earlier in the midlane than the stronger cover/stronger engine balls do. Or if you need to replace an worn HAYWIRE or PHAZE II that finally is showing signs of slowing down. The new Roto Grip HP3 line bowling ball is the Idol. The Idol has the new MicroTrax-S18 coverstock which is the strongest Nano technology the Roto Grip line has used to date. This new cover is wrapped around the new Ikon symmetrical core. My Idol has a 50 x 5 X 60 layout which I also have on my Storm Hyroad Nano. Fortunately, I have been able to leave it at its box surface (2000 grit). I felt the Idol would likely be more archy with an identical layout to the Hyroad Nano. When the Hyroad Nano isn’t quite adding up in terms of motion, I often find myself searching for something that is similar in overall hook, yet different in motion. Fortunately, the Idol fills that gap. I find that the Idol reads the fronts more and has a less angular breakpoint shape without losing any hitting power. The Idol is perfect on fresh house shots where the friction is a little too much for other balls AND when the same house pattern cliffs up and you need to move your eyes in and basically throw it up the oil. I believe this ball is special and I will be ordering another very soon! I can’t wait to see what it does on some flatter, sport compliant patterns. The Roto Grip Idol is a great addition to the RG line. I drilled mine 4.5 x 4 x 4.5 pin down no hole. The IDOL has great shelf appeal with the bright Magenta color, this is some white phasing is some of them. But I have a lot of good compliments on the color of the IDOL as it is different than a lot of bowling balls. With the Haywire being discontinued the IDOL is a perfect replacement. It is a strong symmetrical ball that rolls a little early and smooth downlane. Kinda of like a stronger IQ Solid. It will be a great ball on sport and PBA patterns, and especially at the USBC Open Championships. The Idol is a great new piece from Roto Grip. I was missing my Haywire, and along comes the Idol. The cover is super strong and the Idol picks up early. And that translates into a very smooth slow motion on the back. Perfect for sport shots or hooking backends. The Idol is the perfect replacement for the Haywire. 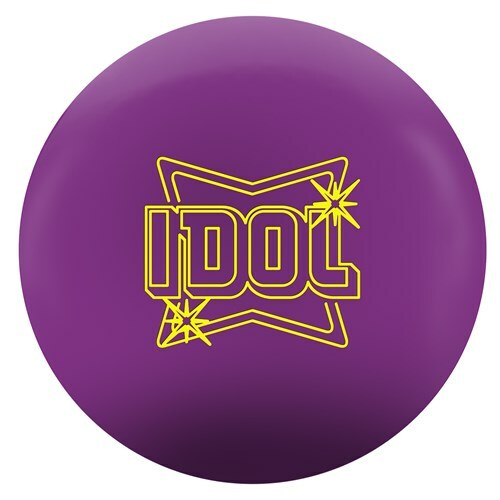 While thinking about the Roto Grip Idol, I can’t say I instantly thought Haywire. But in a way, it is the smooth, controllable, middle of the road ball that surely will replace the Haywire in the Roto Grip lineup. It’s somewhat cover dominant meaning the strength of the ball comes a bit more from the cover than the core. That makes it a nice step down from the high end balls which use more core dynamics to drive ball motion, especially for lower and mid level rev bowlers. As you go up in rev rate, you really start to see bigger motion the Idol is capable of. That is predominantly because with higher rev rates, asyms show a bit more of that hook set motion while the symmetric is more continuous. The Idol is not necessarily a ball I instantly think, this is a match up to every medium condition. That wasn’t the case with the Haywire either. But I think each bowler will need to consider their style and pattern they typically bowl on and decide if this type of ball reaction, good midlane control for medium to medium-heavy conditions, is what they need in their bag. Likes: Where do I start. Great motion, Great continuation, Great hitting power. For me, this is a benchmark ball that I can stay with over the course of a 3 game league set. Dislikes: With my layout, If I jump in too quick it can skid through the spot, leaving bucket's or 2 pins. Other than that, because of the color, It shows the grime from the lanes and machines quite a bit. My layout on the Idol is 60 x 5 x 55. This is a new layout for me which puts the pin in the ring finger and the has the CG out enough for me to drop a 7/8" P3 hole. This ball give me a Great benchmark type motion. This is a ball that I can start the night on and just keep chasing it left with. I have read a lot of reviews on the Idol and many say that it is similar to the Haywire but I disagree. I was never a big fan of the Haywire, however I was a big fan of the DareDevil Trick. The motion I have with this Idol is more comparable to the Trick. Even with the new Strong cover (Micro Trax-S18 solid) Its a little cleaner through the front than the Trick and a stronger motion down lane. To give a little closer look into what I bowl on...We own a 16 lane, wood center, that was built in 1960. We currently use Kegel Prodigy Oil and the house shot is 42' and almost 21mL's. The IDOL has the symmetrical Ikon core weight block in the popular HP3 line, wrapped in the Micro Trax-S18 cover stock, which is a solid reactive core. The box finish is 2000 grit, but as always, can be polished or changed to suit a variety of lane conditions. It is an attractive Magenta color. I have used the IDOL on a 40 ft. kegel house pattern, and The Orleans modified House pattern in Las Vegas. I tried the IDOL at the 2000 grit box finish, and haven’t done any surface changes, as I’ve found this to be my go-to ball when i need to move inside and deal with the pattern trasitioning. I find it to be a little too strong on the fresh house pattern I’ve played on, but was a good starting ball on The Orleans modified house pattern. This ball is more aggressive than i expected it to be. I find it to have a similar motion shape to the Haywire, with a slightly earlier hook, and a stronger finish down lane. Being a lower rev player with ball speed around 14 mph, I could migrate in, left of center with the IDOL and still have it face up to the pocket with proper angle for me to carry. If you’re looking for a replacement for the Haywire, and perhaps a bit stronger, this is a great ball to have in your arsenal. For a mid priced ball, you’re getting the look and hook of a high end ball. It’s a win, win for me! I drilled my Idol 5 x 5 x 3 with no extra-hole. I was really excited when this ball was announced to use and all the hype behind it wasn’t a surprise. After the first few shots with it, it instantly became a favorite ball in my bag. For a ball with a RG of 2.48, this ball is super clean through the front part of the lane with a lot of angle in the back. Compared to the Hyper Cell Fused it was just as clean but a little more hook. These 2 ball will make a great 1-2 punch in any bowlers bag & if you were a fan of a Haywire, you’ll defiantly want this ball. I went with a 70*5*40 layout, pin up above the ring finger with no weight hole. I used the same layout on several other balls. I compared the Idol to my Phaze2 and DareDevil Trick with the Idol being more overall motion than both. Compared to the Phaze2 the Idol is just alittle cleaner through the front part of the lane and much more continuation down lane. Compared to the DareDevil Trick, the Idol picked up in the middle part of the lane much harder and is much stronger. Both the Trick and Idol float through the front part of the lane very well. Once the Idol picked up alittle lane shine after about a game or 2 it really became usable on the hooking pattern cause it didn't pick up quite as fast allowing me to stay in the ball and not have to change balls. Like many, I was extremely unhappy to see the Haywire go away in the Roto lineup (I still have a couple in the closet for a rainy day), so I felt a huge relief when I threw my Idol for the first time. Even though the Idol has a brand new Ikon core and Micro Trax-18 cover, it has that same strong, predictable, even rolling, shape that so many loved from the Haywire. The Idol is the strongest ball in the HP3 line. The Idol is that strong smooth shape that most serious players look for in their bag. I see myself drilling MANY of these in the future. Page created in 0.713 seconds with 23 queries.